While all anesthetic and emergency drugs on the market are made for and administered to both adult and pediatric patients, their dosages and routes of administration are critically different. In the pediatric population, drug dosages are so specific, due to the child's small body mass index, that each drug given is calculated to their specific kilogram weight. 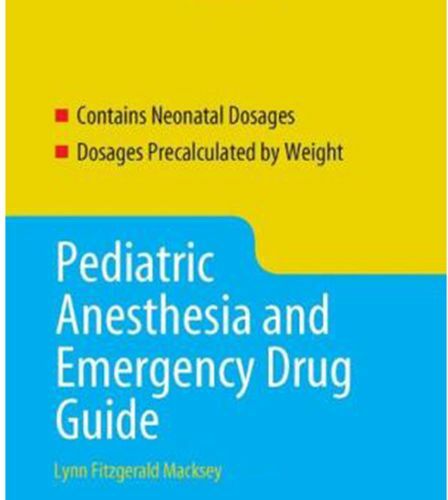 Pediatric Anesthesia and Emergency Drug Guide is the first book that discusses and lists the milligram per kilogram dose range of each drug. Designed as a quick index, the anesthesia care provider for a 21 Kg child can simply open the book to the 21 Kg page, and see all the common anesthetic drugs already calculated both in milligrams and actual cc's to be drawn up for that specific weight, along with calculated intravenous fluids and endotracheal/LMA sizes as well as calculated emergency drugs, cardio-pulmonary resuscitation specific information including: chest compression to ventilation ratio, depth and rate of chest compression, synchronized cardioversion and defibrillation Joules, pulse check placement, and foreign body obstruction maneuvers.